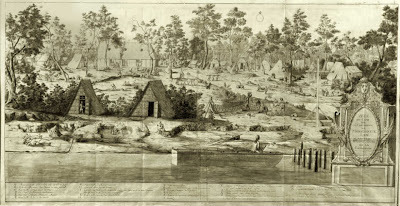 This image, painted in 1720, Veue de Camp shows John Law's Concession of Nouveau Biloxi. The painting is incredibly rich with information of the settlers, the tools they used and the types of trades employed. Generously provided by the Newberry Library, Chicago, IL. 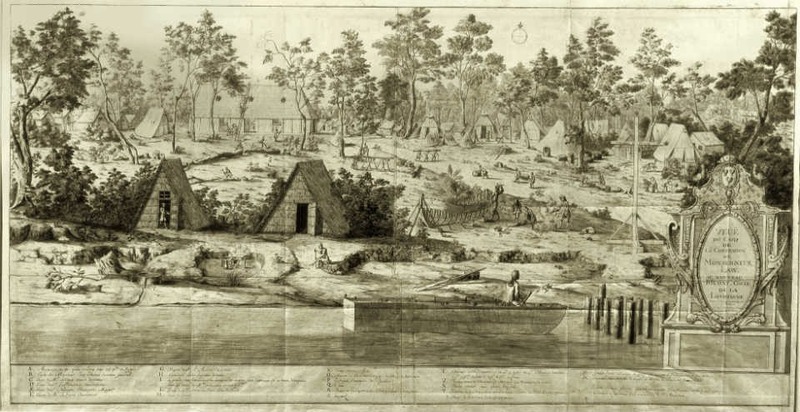 Circa 1716 the first of the French settlers arrived in Louisiana. They were trappers - fur traders. These men were not farmers and relied upon hunting for food. The French government decided it was necessary to have active agriculture if they were to establish a successful new colony. They chose to bring immigrant German farmers to Louisiana to provide their know-how and strong work ethic in order to cultivate this new territory and make it suitable for a settling. The first Germans arriving here would have been in 1719 around Alabama's Mobile Bay and Dauphine Island. Circa 1722 they managed to settle upon what is called the German Coast and lays along the banks of the Mississippi River in the parishes of St Charlse, St John the Baptist and St James (debatable). Some of these farmers were German only in the language they spoke as they came from German speaking regions of France such as Belgium and Alssas Loraine in a time when European borders were dynamic to say the least. These Germans were here approximately 30 years prior to the Acadians that South Louisiana would eventually identify with using the term Cajun. Many of the original German settler's names were Francofied by the literate French governing officials leading to an almost complete loss of the early German's cultural imprint. 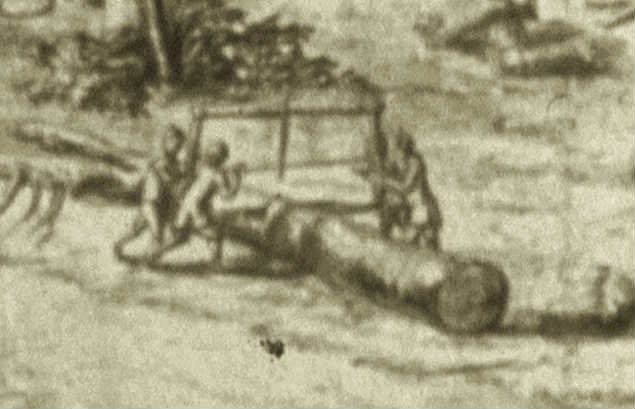 Veue du Camp detail showing Sawyers bucking a log. The Germans arrived to a rich fertile land excellent for agriculture. Their first task was the felling of trees to build structure and make way for the crops they were soon to grow. Imagine walking through the woods, look around at all of the trees, many of them far larger than those today. Now imagine felling all of these trees by axe and imagine them out of the way... What's left behind? Stumps, and plenty of them! These early settlers had no draft animals and subsequently farmed the land around stumps using hoes. Many years passed before European beast of burden were introduced to the land and more modern farming techniques could be employed. Life in early Louisiana was no easy task to say the least. The Germans built Log houses but true log houses in terms of Early America. Square houses with square timbers, so another task they faced was the processing of round trees into square timbers. This was done by hewing the the logs with an axe, a method called juggling allows for the squaring of a log with only a felling axe. Many surviving structures show the tool marks of being scored and hewn - tool marks previously believed to be the result of an adze but which have been proven to be the result of a lesser known axe technique where the log is scored rather than notched with a felling axe . Next the logs were further refined by use of the much heavier finishing tool, the broad axe. 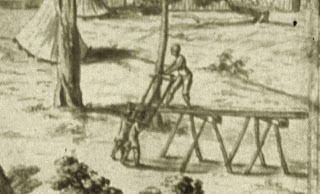 Veue du Camp detail showing Sawyers at work. Further finishing work may have been done in some cases with a tool called a Foot Adze. An adze was more commonly used for fitting adjustments such as to level joist when installing floor boards on Timber Framed structures. This would have been primarily seen on later structures. In addition to hewing timbers, smaller lumber was needed to build a house or barn. These timbers were sawn using the pit saw. Pit saws earned their name from the pits in the ground over which a log was placed. With one worker in the pit (the pitman) controlling the saw's "box" or bottom handle and another standing above (the tillman) steering and controlling the till or top handle of the saw. Now in Louisiana the prospect of digging a five to six foot deep pit is out of the question as the water table and sea level of the land would not allow for the pit to remain dry. In higher areas a compromise was made with a shallow pit and a low supporting structure to elevate the log further and allow this sawing work to be performed. The less energy required to raise a log from the ground the better for the workers. Evidence of these pits is present in areas along the German coast but have mainly been erased by the continuing expansion of modern commercial farming. Once these smaller timbers were sawn they must be held together to form the structure. This construction style is referred to as timber frame construction... A system of mortices, tenons, wedged scarfs, half laps and other joints held together by both physics and wooden pegs. These pegs were made by rieving green oak, hickory or Cypress into small billets with a froe and beetle then allowing them to dry. It was important to use dry seasoned wood for these pegs as green wood would shrink leaving the joints week. And exception to this was likely made on early structures. Building the structure with all green timbers would mean the timbers would also shrink compensating for this. The pegs were then shaped on a shave horse, a form of foot operated clamping bench, with a draw knife. These same tools wouldd have also been used to produce shakes, or wooden shingles, to cover the roof. of water vessels was of immense importance in the Americas - particularly the swamp Gulf Coast. The 1780's & 90's would have been the first period of real commercial prospect of Cypress lumbering. At this time Louisiana was not yet a part of the American states and was under Spanish rule. This was the early days of the New Orlean's Cooperage industry, the trade of building barrels and crates and cisterns. The major market for Cypress was in the form of empty sugar boxes exported to the Spanish Caribean for the packaging and sale of sugar. Louisiana had small crops of sugar cane here and there for use in syrup making but the process of granualization had not yet been introduced. As the end of the 90's approached this export industry all but stopped due to political upheavals. While the export of Cypress dwindled the domestic use of cypress experienced a massive upswing due to the Good Friday Fire. New Orleans was a well establish port city and in 1788 on Good Friday, a day of reverence observed by the predominantly Catholic state the Friday before Easter, resulted in the burning of approximately 80% of the city. 956 building and residencies burned to the ground. Six years later in 1794 another fire broke out consuming approx 20% of the city or 206 buildings. This sudden need for lumber in the rebuilding of businesses and homes meant a rapid growth of the lumber industry. The demand for lumber was so high that many lumber yards in New Orleans were unable to acquire lumber quick enough and many builders resorted to using green, unseasoned lumber - a practice frowned upon by architects and builders alike. This shortage also lead to extensive poaching of lumber by unscrupulous fellers. staves at a Shave Horse. BR: Fitting hoops to a barrel. BL: Assembling the staves to make a barrel. In addition to the housing demands for lumber, New Orleans continued to have a thriving cooperage industry due to the prominence of its river port. Another community in need of lumber was the vast furniture or cabinet building tradesmen. These highly skilled craftsmen were largely French in origin but again being a port city there were many others arriving daily. Englishmen, Haitians, and Germans were among those. One very prominent cabinet builder, known today only as the Butterfly Man, was believed to have been a free man of color. Despite the typical impression of that period it was not uncommon for free men of color and slaves alike to hold positions of importance in all skilled trades. Further it was very common for these men to be supervisors over and be responsible for distributing pay to laborers of lesser or equal skill. 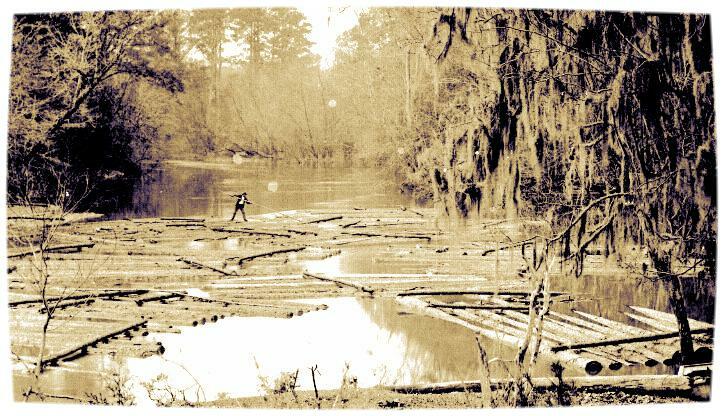 Nearly every wood furnishing item produced in Louisiana for the first century contained Cypress lumber in some fashion. Early pieces, commonly referred to as Acadian style with its characteristic lack of embellishments and classic tapers would have been solely comprised of Cypress. As the early Federal Period began to gain popularity along with its rich inlays and exotic veneers Cypress remained the main furniture lumber in Louisiana however hidden under those veneers and as drawer sides and bottoms - a use referred to as secondary lumber. The pit saw remained the predominate means of cutting lumber until the early 1800's. While the rest of the country was employing water wheel driven sash mills this wasn't an option for Louisiana Lumberers. The lack of mountains or hills here meant a lack of moving water sufficient to power a water wheel. In 1803 an industrious individual had the brilliant idea of digging a trench from the swamp to the river's levee. After the spring flood came and crested the levee's banks the water trapped in the swamp would normally find it's way out through the swamps. This time though after the river receded this man cut a trench through the levee as well causing this trapped water to rush back to the river. This allowed him to power a water wheel! The other ingenious aspect of this design was that this rapidly moving water gave him an excellent means of moving his logs from the draining swamp to the mill that would saw them!1816 saw the first steam powered saw mill however the high price of steam engines made this cost prohibitive to most mills. As an illustration of this in 1835 an inventory of Evergreen Plantation in Edgard was done following a bankruptcy proceeding. In this assessment of assets the beautiful plantation home along with it's large furniture items was valued at $10,000. Compare this to the 16 horse power steam engine on the property assessed at $7,600! This was a poor quality steam engine from New York at that, the more reliable steam engines came from Pa and cost as much as $20,000. Despite the high cost of steam power it eventually dominated the lumbering industry and was Louisiana's own Industrial Revolution. 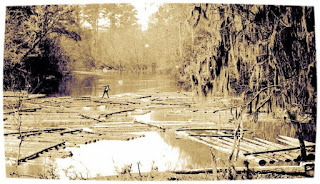 Soon steam and donkey engines dominated Louisiana's swamps with drag lines. By the early 1900's there were countless saw mill town such as Donner located just southwest of Thibodaux, LA. Some of my recent ancestors recall their lives in the mill town of Donner, how they relied upon the mighty Cypress swamps to provide jobs and food. They recall how the mills were so advanced that these communities were the first to experience in-home electricity provided by generators of the mill. By 1950 virtually every virgin cypress stand was gone and the milling industry came to a grinding halt. An industry that once over shadowed cotton and sugar cane now vanished like the cypress trees it relied upon - a tragic lack of resource management for the economy and swamps alike. To the discerning eye, there remain many subtle reminders of Louisiana's history with the mighty Cypress tree. From the culturally rich Acadian houses and plantation homes whose craftsmen still speak to us through the tool marks found upon their cypress trusses, the abandoned mills that have been overcome by the returning Cypress Swamps which they once obliterated, to the once lost but found again sinker Cypress logs raised from the depths of bayous and rivers by modern day lumberers. To this day, Cypress remains a highly coveted lumber for structures and furniture alike. Unfortunately, very few remember the tenacity, determination and will to overcome that our ancestors extolled in the early days of lumbering along the German Coast. The opening image for this article was probably of an imaginary Occidental scene. The historical record points to a situation contrary to the industry and effort portrayed in the Biloxi image above. John Law's associates conducted a very active propaganda campaign to make "the Mississipi" appear as an attractive destination for French emigrants. Too many investors in the Mississippi Bubble had too much to lose if colonists didn't flock to the New World settlements of the Mississippi Basin. The fact that they finally had to induce Germans to move to Louisiana underscores the wariness that the French population had for la Louisiane after hearing horror stories from returning contractees and sailors regarding starvation, mosquitoes, and conflict with Native nations. One of the most disappointing realities that settlers faced was that their wheat crops were unsuitable for the Gulf soil and climate. Their resistance to corn consumption caused great hardship and suffering. The venal corruption of the government, at all levels, made agriculture and commerce difficult. Louis XIV forbade the seigneurial system in Louisiana, but the colonial organizers tried to circumvent that interdiction in practice. A good source of information regarding this tragic facade is the book "Le Plus Beau Païs du Monde" by May Rush Gwin Waggoner, published by the Center for Louisiana Studies in Lafayette.